The first trailer for the Australian surf flick Drift was just released from Twitch, and at first glance, this ’70s drama could either be a hit or a miss. Myles Pollard and Xavier Samuel lead the film as brothers Andy and Jimmy Kelly. Sporting some jaw-dropping killer wigs, the duo must use unconventional methods to help pull their family out of debt. Whether that means inventing new surf products like boards and wetsuits, or quitting a day job. The pair will also have to battle drug dealers to maintain the new lives they’ve built. 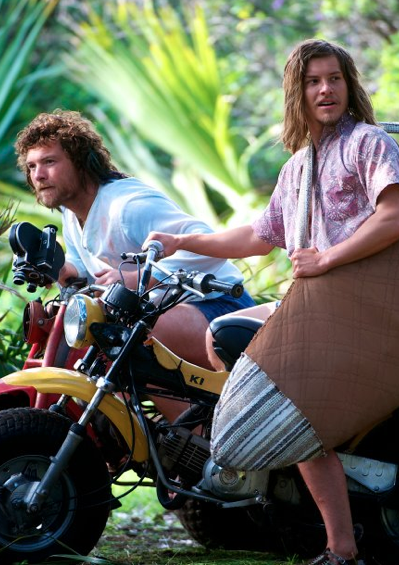 Luckily, bohemian free spirited surf photographer JB, played by Hollywood hunk Sam Worthington, will accompany the bros on their journey. Well, maybe not so luckily, as it’s unclear as to just which parts of the surf life JB will push them towards the most. Drift is based off the true story of Australia’s legendary surfwear moguls, and will chronicle the beginnings of surf brands and the surf lifestyle. Standing behind the camera is Australian native and seasoned filmmaker Tim Duffy, who this time will serve as the producer; he’s joined by directing newcomers, Morgan O’ Neill and Ben Nott. Will ‘Drift’ Make Waves at the Box Office? Can Drift really stand out from the other films of its kind – Chasing Mavericks, Soul Surfer, and Blue Crush – or has the genre been beat to death? With all the strives to make a unique story, I hope the filmmakers can turn it out. A combination of Duffy’s passion and Worthington’s star power will definitely give the film more movie goer buzz, but I wonder if it will be worth the payoff. Although the film is intended to release in Australia in 2013, no American release date has been set at this time. Check back with RMN for more updates on Drift!